In the interest of time.. "I'll just tell you how it ends" Mr. Lofton was a tall (somewhat lanky), generous older man that attended our church growing up. I remember him vividly on days that are tougher than others and whenever I catch a whiff of butterscotch. His stories were brief, as he seemed to always be busy, and would end with him giving me a piece of hard candy that taste like caramel and tapping me on my shoulder as he walked away. But he was a storyteller none the less, who seemed to favor one certain saying... "In the interest of time, I'll make this quick. You should always look at what's around you and appreciate it. Slowly turn around", he'd say- as he'd spin me in a circle- "and take it all in because the view will be different tomorrow." In the interest of time... We hurry things along, take abbreviated versions of breaks that really just equate to 15 minutes of not looking at the emails that are unanswered on your phone. I'm very guilty of this. Or that "one last thing" you tell yourself you're going to finish then call it a night early. However, "going to bed early" is 1 am on a Wednesday night after you've been up since 3 am the night before. We fail to realize that time only moves in one direction and as you take on more projects and clock more hours (60+) a week, you're losing everything else running parallel in your peripheral vision as you climb the corporate ladder. Like school award ceremonies and playdates, better yet, signs that you might not be in the best of health. Until you find yourself staring at the walls of a hospital room that doesn't care about your conference call, the standing Tuesday project meeting or the flight you have to catch at noon. In the interest of time, I'll just say that I've learned a valuable lesson in the last 2 months. How much I've let Mr. Lofton down in his attempts to get me to take time and slowly take in the things around me. Let's just say, I'll make more time, work less hours and make more biscuits. And in the interest of time, we'll use cream and self rising flour to get the fluffy rise that we love so much. These require a lot less instructions than some of my more involved recipes, leaving more time to enjoy other things we might've missed or maybe just to sit outside with your face turned to the sun. In the interest of time, we'll sit back and appreciate it more, because it won't look the same tomorrow. Directions: Preheat oven to 425 Whisk together flour and cornmeal in a large bowl. Make a well in the center and pour in cream stirring until flour is moistened. Add in the sugar Mix with spatula until the dough begins to pull away from the sides of the bowl. If there is flour remaining on the bottom of the bowl add some additional cream (about a tablespoon at a time). Lightly sprinkle a board or other clean surface with flour. Turn dough out onto board and sprinkle a little flour on top of the dough. With floured hands, pat dough out to a ½ inch thick, fold dough in half and pat out into a ½ an inch thick for a normal size biscuit or about ¾ inch for taller biscuits. Brush off any visible flour from the tops of the biscuits. Using a biscuit cutter (or the rim of a drinking glass) cut out each biscuit. Use the scraps to make additional biscuits. Waste not want not. 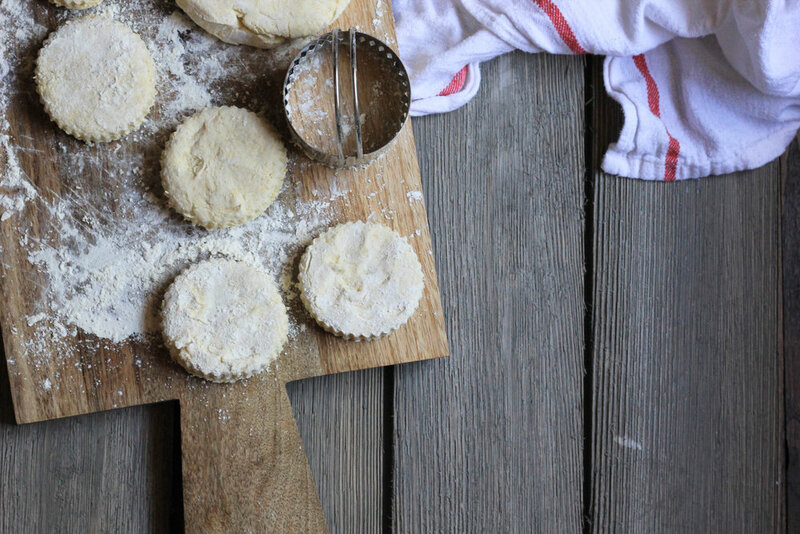 Place biscuits onto a baking pan or cast iron skillet. Bake biscuits for a total of 10-15 minutes. Remove from the oven and serve while warm. Brush biscuit tops with melted butter if that’s your thing.